The CHE is mandated to provide independent, research-based advice to the Minister of Higher Education and Training on matters relating to higher education, either at the request of the Minister or proactively. The Council of Higher Education is responsible for auditing the quality assurance mechanisms of higher education institutions, in accordance with the Higher Education Act (No. 101 of 1997). Between 2004 and 2011 the CHE implemented the first cycle of institutional audits where all public HEIs and 11 private HEIs underwent institutional audits. In 2018, the HEQC closed the last remaining institutional audit from the first cycle. Reports from the first cycle of audits, together with a detailed analysis of student throughput rates, showed that a system-wide focus on teaching and learning at higher education institutions was needed. In 2014 the CHE launched the Quality Enhancement Project in order to improve student success across the higher education system through both individual institutional and collaborative activities and interventions across the sector and with the Department of Higher Education and Training. The QEP was concluded in 2018 in order to make way for the reintroduction of institutional audits. In 2016, following the decision by the Council, the CHE started to develop a framework for the next round of institutional audits. The draft Framework was approved by the HEQC, and noted by Council, in 2018 for piloting in 2019. 3 institutions (2 public and 1 private) were requested and agreed to participate in the pilots, with the aim of testing the effectiveness of the new institutional audits approach. The outcomes and lessons from the pilot audits, scheduled for March 2019, will be used to refine the Framework before the full sector-wide rollout of institutional audits. The mandate of the QAPC Directorate is to promote quality among the public and private providers of higher education in South Africa as contemplated in Section 5(1)(c)(i) of the Higher Education Act (Act No. 101 of 1997), as amended. The HEQCIS is a CHE information system that stores information about the qualifications that private higher education institutions may offer, and the learner enrolments and achievements against them. The HEQCIS in turn serves as a tool to populate the National Learners' Records Database (NLRD) held and maintained by the South African Qualifications Authority (SAQA). The CHE is required to submit this information to the NLRD for all higher education institutions. Follow these easy steps to comply. It will take you more or less 3 months to complete the full process. It is difficult to determine beforehand precisely how long each individual step will take. Therefore the indicated timeframe (in brackets) should be taken as an estimation that may be shorter or longer depending on your specific case. You can download the documentation required per step beforehand to speed up the process. After each step we will give you feedback before you continue to the next step. The HEQSF Implementation webpage is dedicated to providing all public and private higher education institutions with sufficient information and tools to guide them as they undertake the process of aligning their programmes with the HEQSF, and explaining the process whereby programmes will be captured nationally in as efficient and effective manner as possible to ensure a smooth transition to the new framework. Information on this webpage can be distributed to a large number of individuals within the higher education sector to support capacity development and information sharing. On this page, institutions are able access updated and archived versions of working documents such as the HEQSF Implementation Handbook, policy documents such as the HEQSF, and other useful publications such as the CHE-HEQSF 1, Joint Communiqués 1 - 4, SAQA Level Descriptors and Classification of Educational Subject Matter (CESM). The HEQSF-Online is a web-based application system that allows public and private higher education providers to submit applications for the HEQSF-alignment of programmes online. Institutions will be able to upload and submit applications from 04 April - 30 September 2011. In addition, as the HEQSF Implementation process will be taking place in both the offline and online environments, institutions are able to download the HEQSF Implementation Template from this page as well as access the HEQSF-Online system directly. The CHE is mandated to ‘provide relevant, timely and independent advice on matters concerning the condition and development of higher education’ in order to assess the health of the system. In order to fulfil its mandate the CHE focuses on regular monitoring of the higher education sector and analysis of achievements and challenges within the sector. To complement on-going monitoring, the CHE also engages in more in-depth research projects focused on specific areas of concern. For more information on current activities, refer to the discussion of the specific monitoring projects. Monitoring information is also used to support the work being undertaken in other directorates. The National Reviews are about re- accrediting existing programmes offered at higher education institutions and form part of the CHE's quality assurance system. One of its aims is to increase public confidence in higher education programmes and qualifications. This Framework sets out the evaluation and re-accreditation policy for programmes and qualifications identified for national review. Since approval of an original Framework for national review in September 2012, there have been two major developments affecting the approach to national reviews. One is the implementation of the HEQSF gazetted in October 2014. The other is progress by the CHE in development of standards for higher education qualifications. Qualification standards serve an important function as part of the national review process, in that the standard provides a benchmark for the purpose of the qualification and the graduate attributes that manifest it. This Framework replaces the original Framework approved in September 2012. The National Review process is aligned with the programme accreditation system which evaluates new programmes and existing programmes. The fundamental aims of a national review are to ensure that minimum standards in programmes are met, that students are protected from programmes that do not meet minimum quality standards and that public confidence in higher education programmes is assured. To be re-accredited, programmes need to meet the national qualification standard and the programme-level criteria. To strengthen the monitoring and quality development functions of the CHE, the organisation also engages in research projects focused on higher education issues. Relevant issues are identified through activities such as on-going monitoring, or from policy debates that have arisen in the sector, or from requests for advice from the Minister or other relevant stakeholders. The emphasis in this set of activities is the proactive undertaking of relevant projects within a theoretical framework that defines the higher education landscape and the issues within it. The projects section describes ongoing research projects, as well as relevant projects which have been completed in the last few years. Research is also published in the CHE’s journal, Kagisano and in the Higher Education Monitor. The Higher Education Qualifications Sub-Framework (HEQSF) assigns to the CHE the responsibility for developing standards for all higher education qualifications. The CHE must ensure that such qualifications meet the criteria of the South African Qualifications Authority (SAQA) for registration on the National Qualifications Framework (NQF) in terms of section 1(f)(ii) of the Higher Education Act as amended. The HEQSF requires that standards must have legitimacy, credibility and a common, well-understood meaning, and they must provide benchmarks to guide the development, implementation and quality assurance of programmes leading to qualifications. The role of the CHE as the Quality Council for Higher Education means that its responsibility for standards should proceed alongside its other statutory responsibilities in the areas of quality assurance, including the accreditation and re-accreditation of programmes, institutional reviews, and national reviews. The co-existence of all these responsibilities in the same body puts the CHE in a privileged position to advance the objectives of the National Qualifications Framework (NQF) within the higher education system. One of the roles of the Directorate is to develop policy and a framework for qualification standards, including adapting the standards to qualification types, academic fields and disciplines, with the aim of informing and guiding the development, registration and publication of qualifications. The CHE proposes a limited approach to standards development, focusing in the first instance on standards relating to the generic qualification types in the revised HEQSF and, secondly, on standards relating to the broad subject fields aligned with the Classification of Educational Subject Matter (CESM) categories that are used by the DHET for funding purposes. The CHE will rely to a great extent on academic expertise in the relevant fields or disciplines, since the focus is on the purpose, outcomes and graduate attributes that characterize specific knowledge fields and disciplines. The Directorate will engage experts groups in the development of qualification standards. The CHE will establish a Standards Advisory Committee, comprising representatives of the higher education sector, to advise the CHE on the coordination of the standards development project, and to provide advice on the validity, consistency and compatibility of the standards developed by various expert groups. Emphasis is also placed on the need for standards development at a national level to recognize and accommodate the need for institutional autonomy in respect of the design, delivery, assessment and evaluation of institutional programmes leading to qualifications on the HEQSF. To give effect to its mandate, the CHE has developed a Framework for Qualification Standards in Higher Education. A first draft of the Framework was sent to all parties in the higher education sector on December 2011, with an invitation for the submission of comments. A Summary of Submissions and CHE Responses was subsequently circulated. Institutional and other comments, concerns and recommendation were taken into account in the preparation of a second draft of the Framework, which was endorsed by the Higher Education Quality Committee (HEQC) on February 2013 and approved by the Council in March 2013. The expanded CHE mandate includes the development of standards for qualifications in higher education. A qualification standard is a generic statement of the learning domains, the level of achievement and the graduate attributes that characterise, and are required for the award of the qualification. They set out expectations about standards of qualifications in a range of fields of study, describing what gives a discipline its distinctiveness. National qualification standards provide both compliance benchmarks and developmental indicators for qualification types as awarded in particular fields of study or disciplines. Enhanced student learning with a view to increasing the number of graduates with attributes that are personally, professionally and socially valuable. Enhancing course and programme enrolment management. A higher education system that is improving continuously as members of the higher education community collaborate to share good practice and solve shared problems. "Promoting Academic Integrity in Higher Education." The CHE is pleased to announce that it is organising a quality promotion conference which will take place from 26 to 28 February 2019 in Pretoria, South Africa. The Conference will take place at the CSIR International Convention Centre, the CSIR ICC is ideally situated on the science and technology hub of Pretoria. More details about the venue are provided below. The CHE has been engaged with collecting and analysing data on the higher education sector and makes this information available through publications and its website. In order to continually adapt to the changing educational environment, the CHE is in the process of developing a theoretically and empirically well-informed set of indicators for the monitoring of the higher education system. This will involve the analysis of national policy in a changing higher education landscape to establish to what extent national goals are identifiable and can be used to inform an organising framework for the collection of data and production of performance indicators. *This information is collected from higher education institutions during and at the end of each academic year. Once it has been collected, it is verified and audited and discrepancies are resolved. For this reason, the audited figures for 2008 will only become available in the second half of 2009. Headcount enrolments in higher education for the years 2016 to 2014, starting with the latest first. This set covers enrolments per institution, showing undergraduate to Doctoral data as well as enrolments per each of the four major CESM categories. Headcount graduates in higher education for the years 2016 to 2014, starting with the latest first. This set covers graduate data per institution, showing undergraduate to Doctoral data as well as graduates per each of the four major CESM categories. This datasheet gives an overview of the staff at each university overall and shows those classified under senior management of the universities. The demographics of the staff is shown as well and the gender and employment status. The employment status of academic staff is shown and their demographics and gender data. This datasheet also shows the number of academics who hold Doctoral qualifications and those academics appointed at the level of professor. This datasheet provides growth rates in enrolments, graduates and academic staff. We show a rounded throughput rate by qualification type per university and an indication of the headcount first-time entering students per qualification type at the start of a particular cohort. This datasheet mostly holds what can be classified under financial data per university. We show Research output, research grants, teaching output grants and the funding proportions per university. The following links show the same information as the datasheets above, but in a grouping by institutional type condensing all the datasheets above into one per institutional type. Or download it all as one large datasheet for your convenience. All of this data and much more can be found in the Vitalstats publications. If you wish to download our Vitalstats publications, please follow the link below. 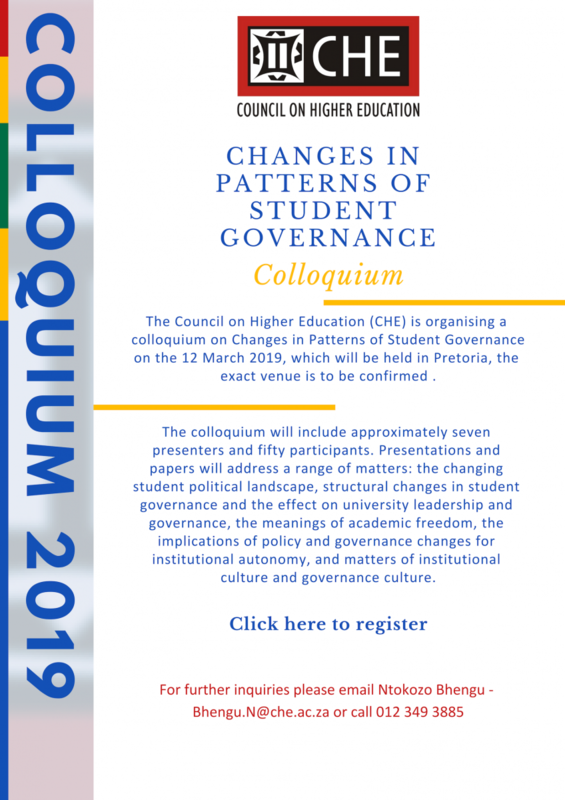 The Council on Higher Education (CHE) is organising a colloquium on Changes in Patterns of Student Governance on the 12 March 2019, which will be held in Pretoria, the exact venue is to be confirmed. The colloquium will include approximately seven presenters and fifty participants. Presentations and papers will address a range of matters: the changing student political landscape, structural changes in student governance and the effect on university leadership and governance, the meanings of academic freedom, the implications of policy and governance changes for institutional autonomy, and matters of institutional culture and governance culture. The Council on Higher Education is responsible for the accreditation of public and private higher education institutions' learning programmes leading to qualifications registered on the National Qualifications Framework (NQF) and registered by the Department of Higher Education and Training. The Accreditation Directorate carries out this work by developing and operating the HEQC-online system through which institutions submit programmes for accreditation. As well as new programmes, these include programmes to which significant changes have been made. The Directorate is supported in its work by an Accreditation Committee.